Mum: It’s a ‘Best Speaker’ ribbon – I won it in my Toastmasters Club, it’s like an award. Boy: Can I borrow it for my bedroom, like I borrowed your old swimming trophies? Mum: You can HAVE it if you like? Boy: No. I have to WIN it, I can’t just have it. Boy: We need to have a competition. I’ll say “put your hands on your head” or “put your hands in the air” or “put your fingers in your ears” and the first one to do it wins. The one with the most points wins the ribbon. Mum: We could do that, but it’s an award for the sort of speaking where you tell a story. Boy: But who can I tell a story to? Not just you, that wouldn’t work. Mum: What about your teddies? Boy: OK, I’ll tell a story to my teddies and you have to tell me if it’s good enough for the ribbon. Don’t just say it’s good though – you can say if it’s not good enough. Mum: OK, how about I tell you the things I liked about it and also things you could do to improve it? Boy: Yes! And if there are more things that you liked about it than things to improve, then I win the ribbon. But not if there’s more things to improve than you liked. Mum: OK – Go on. Boy: Once upon a time, there lived a boy and his name was Tom. He lived with his mum and he grew up to be really happy in his house. Then all of a sudden his mum died, and his dad had to look after Tom all by himself. One day, his dad took him out for a walk in the woods and it was very strange because it all looked like winter, but it was the middle of summer! The End. I loved the storyline – it was a bit sad wasn’t it, but very interesting and you had some really good ideas in there – like summer looking like winter. I also like the structure, you had: a beginning – once upon a time and it was great how you gave the boy a name, Tom; a middle – where he was happy in his house and then the mum suddenly died; and an end – where things started to look different. I also liked the expression you used in your voice when you were telling the story – you made the ending sound very mysterious. I liked it so much that, the only thing I could suggest if you wanted to improve it would be to think about using some more describing words – adjectives. Boy: I know what describing words are – it’s when you say a thing and then you describe it! Mum: Yes, so you could have said something like “he grew up to be really happy in his BEAUTIFUL house” or “HEAVENLY house”. Boy: Yes, I see… So was it good enough for the ribbon? Mum: Yes! I liked three things about it, but could only suggest one thing to improve, couldn’t I? Boy: Was it three? Yes – I liked the storyline, the structure and the expression you used in your voice. Boy: Oh yes. I WISH I could stick it on my wall. Mum: Here [passes some white tack]. 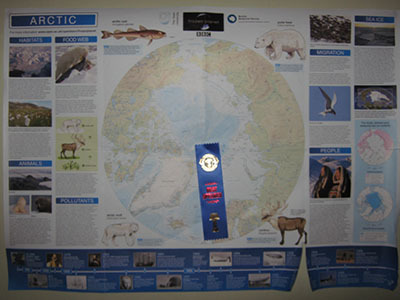 Boy: [Sticks the ribbon in the centre of the world image on the OU Frozen Planet poster by his bed] I want to stick it here because I look at this poster every night. I read all the parts of it every night – it helps me when I’m not feeling sleepy. D: I was drawing them at Vikki’s and I thought – I’ll cut out a cactus out for my mum. And then I thought I’ll cut the others out for my dad and Nanny and Grandpa when I go there tomorrow. Me: That’s nice. Why were you drawing trees and cacti? 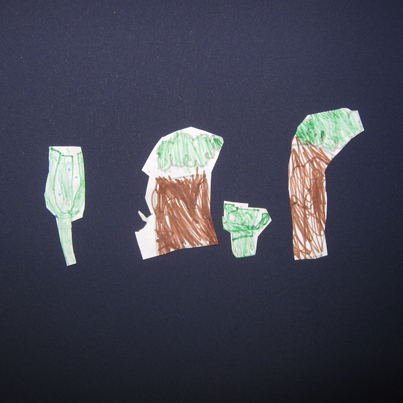 D: I was drawing Africa – Africa’s got lots of trees and cactuses. Me: Did you draw anything else in the picture of Africa, other than trees and cacti? D: Yes, and some water – the water was in the shape of Africa. Me: This shape here, on this globe? D: That’s not Africa – it’s got lots of different coloured shapes in it. Me: That’s because they’re all countries and Africa is a continent. Me: It’s a group of countries. D: Oh. Oops – no. I did the water round, like that, with a bumpy bit there [draws it in the air] – I just made it up! D: How big is this world? Me: Huge! Not as big as Saturn and the other big planets, though. D: It’s bigger than Pluto though. Me: Yes – because Pluto’s a dwarf planet isn’t it? D: No! It’s just small. Mercury‘s like Earth, but all the people are really hot. D: Yes, because it’s the closest to the sun. But it’s OK, it won’t melt, because it’s a METAL planet – it’s made from metal. But all the people on it are sad because they can’t have Christmas. D: Because all the snow would melt. So it snows, and straight away it melts. So they can’t have Christmas. D: I wish I could go to the Moon and explore. Me: Maybe one day, but in a few weeks’ time we can go to Crete to explore – and that’s a different part of the Earth. AND we’ll be near a beach! D: Yes, and we can take our fishing net and catch some fish! But we MUST be careful because, if our net gets heavy or breaks, it means we’ve accidentally caught a shark or a crocodile.